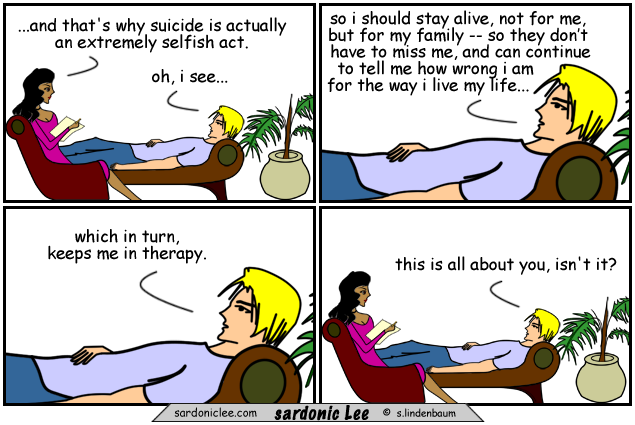 Hey, ya finally figured it out, therapy is for the therapist, LOL. You look good on the couch though! Suicide is the permanent answer to a temporary problem anyway. 🙂 Hahaha! Suicide is simply taking control of reincarnation. So it’s actually a selfish control issue. I’m certain narcissism is in the equation as well. Always is. is it so selfish just to want 72 virgins? I feel like this every three months ; I swear shrinks are selflessly self involved…. i just get this way around this time of year …. right before “american suicidol” premieres. If you commit suicide, I’m going to kill you!